Good Working P38 RANGE ROVER EAS AIR SUSPENSION VALVE BLOCK DRIVER PACK. This item has been inspected and tested. Your car should begin to rise within two minutes once this is fitted. If it does not I'm afraid your suspension has another fault which requires fixing. Valve block and driver testing available.... It does not mean you need a new valve block!! Simply repair or replace your pump and clear the codes down. You should always start by checking your air compressor output. If your land rover specialist has not done this then they should not be working on your vehicle :0... Beep, Beep, on the dashboard message panel will prevent pump from working and you will still need to reset your ecu for this pump to run. Once a working pump is fitted please check your air springs for damage, splits, cracks, cording (at sides) and wear. It's best to replace worn springs in pairs unless one has already been done. If the vehicle sinks down considerably whilst parked or over night you have air leaks which will wear out your pump prematurely. Your P38 Range Rover should not sink down on its own, this means there is a problem with the system. A faulty valve block, relay, leaky air springs and worn height sensors or a compromised receiver (air tank) will all put extra wear on your pump. Please perform drop and lift tests and make sure your pump turns off after a few minutes and stays off until a demand is placed on the system by lowering and raising the vehicle. If the pump runs all of the time or constantly on and off and or the vehicle will not lift straight up in seconds from access in a morning you have problems which need attention before you get beep beeped. Prevention is always cheaper than inconvenient remedial action. Take care, look out for the dreaded white powder in the eas system which sticks the diaphragm closed (or open) and blocks the airflow pathways and chambers in your valve block. You won't find any mention of replacing or servicing it in your books or manuals though one technical bulletin was released in the late nineties advising replacement under service at 60,000 miles or six years if white powder visible.... It was supposed to last the lifetime of the vehicle :0. Some air dryers even collapse firing silica gel straight through the block destroying it completely. Most P38's are still running around on their original dryer (see the 2 number year code on the lid in the little circle).. The air dryer is a ticking time bomb on any air suspension system and should never be ignored! Our ntc9812 kit contains top quality automotive vacuum packed desiccant (not grip seal silica) and we provide full o ring set with new pads too. Simply screw off the lid and replace in the same order as it comes out. Be careful not to crack the plastic case you naughty little vice guys :0. New air dryers also available! See my other listings, especially the stand alone valve sets which are really useful enabling you to stay up on air until repaired or for pressure testing each spring and the system including the receiver (reservoir, line 6). If your pump is running all of the time the thermostat will eventually fail rendering the pump useless. Please repair any system faults as they occur. A stock photo has been used. PUMPS WANTED FOR SPARES OR REPAIRS. Support UK business and get your items quicker. Please take a look at my p38 air suspension seal kits... Best quality at the best price! Write down any fault codes before clearing them as they are frequently required to diagnose the problems with the system. We are a small family hands on manufacturing and retailing business in the Midlands of England specializing in Air suspension products. We have been providing products for our customers both at home and worldwide for many years as illustrated in our feedback history. This experience goes directly into all of our products which we feel is very important. We are a hands on innovative company in this field with all of our products being tailored towards the' Do It Yourself' home mechanic. Please do not hesitate to contact Simon on 07890 597572 should you require any further information with regard to any of our products or for after sales service. There is always a solution and alternative to a coil spring conversion. Don't coil it unless you want to spoil it! The item "P38 RANGE ROVER EAS AIR SUSPENSION VALVE BLOCK DRIVER PACK RVH100030" is in sale since Tuesday, June 20, 2017. 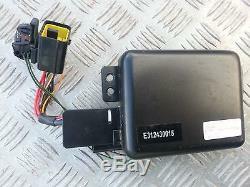 This item is in the category "Vehicle Parts & Accessories\Car Parts\Suspension & Steering\Other Suspension & Steering". The seller is "original_landyair" and is located in rugeley, Staffordshire.